Yes yes, I know everyone has already had this and reviewed it. I've been meaning to get it for ages but this is my take on it. 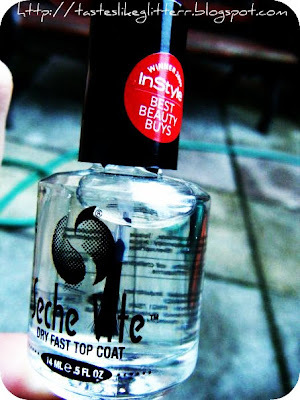 I finally got around to ordering this last week along with another top coat. Which if you follow me on Twitter you'd have probably seen me tweeting about because I just can't get enough of it but I'll save that for another post. This actually does what it says, 'fast drying'. It really is! I've had countless polishes in the past both coloured and top coats that say fast drying but take forever to dry. They're the kind after a couple minutes you can press on and get an indent of your fingerprint, and that is not a good look. I applied this and less then a minute later (could have been 30 seconds?) I touched it, no stickyness. Pushed down on it, no fingerprint. I even tried to force one of my nails down into the polish and there was no mark what so ever. This is just what I need. I hate waiting for polish to dry as I can be really impatient at times. So if you haven't already got this you must get it now!